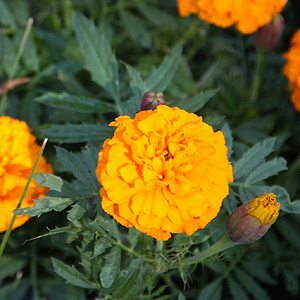 The ever popular Marigold is an easy plant to grow from seed although they are generally also readily available as seedlings from your local nursery or garden centre in spring. However when looking for Marigolds be a little careful as a number of species carry the name. Germination of Marigold seeds is quick, it takes around 1 – 2 weeks if they are planted in a warm position, indoors or in a heated propagation tray. You do need to start them off around 4 – 6 weeks before the danger of frosts has past, in a frost free zone you can plant them directly into the garden as soon as the weather warms a little in spring. The seeds are best planted on a finely tilled soil, sow them on the surface and then cover them lightly with some sieved compost or soil. If you have grown them indoors, plant the seedlings at around 7 inches (18 cm) apart. If you have sown the seed directly thin to this spacing. Larger growing varieties will need to be planted at 12 inches (30 cm) apart. They are best planted in full sun, in warmer climates give them good morning sun and a little afternoon shade. The African marigold is Tagetes erecta, and the Tagetes species are interestingly, originally from Mexico. Tagetes tenuifolia or ‘Signet Marigold’ is another. What we usually see in nurseries are the French Marigolds, used widely as bedding plants, mass displays of color. Fairly tough and more tolerant of dry conditions. The French marigold is shorter and will reach around 1/3m. The English Marigold or Pot marigold require a a little more moisture, usually not as prolific in terms of flowers and a little limited in color. The African Marigold is the toughest, drought tolerant and Tagetes erecta is a taller growing plant some to nearly 1m depending on cultivar. Tagetes lemmonii is a shrubby plant that is winter flowering, evergreen and reaching around 1.5m in height. All three species flower from early summer through to autumn and prefer a humus rich moist soil although they can cope with low water provision.